I love her style. Susie has blog candy which ends today, but go look at her site it's well worth a visit. This was my first attempt using Paper Dolls. I cut the hair from velvet paper for texture. The lapels are glittered and cut from the Wedding cartridge. The bottle, a dingbat, it is 9.5" high and was cut with SCAL and the label is computer generated. (I forgot to put the wire on for the photograph). 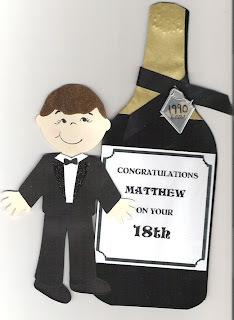 The boy and the bottle are free standing, although they look as if they are on card.